The new year, 2019, is just a couple of hours old and it is normal for many manufacturers to be sending new year messages on different social platforms. 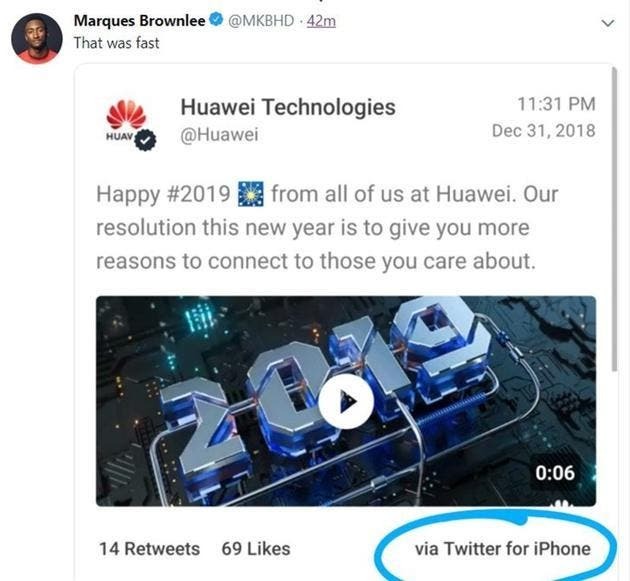 However, Chinese manufacturing giant, Huawei made a serious blunder when it sent its new year message on Twitter by using an iPhone to do so. At 11:31 on the evening of December 31, Huawei sent a New Year greeting on Twitter to its numerous customers on behalf of all Huawei’s employees. However, under the tweet, we can clearly see the inscription “Via Twitter for iPhone”. This means that whoever was operating Huawei’s official Twitter account, probably did so with an iPhone. After Huawei sent this tweet, it was deleted immediately. Nevertheless, a Twitter user “Marques Brownlee” got this blunder on a screenshot. Some netizens refer to Marques as “Twitter Police” because he has repeatedly arrested similar incidents from other vendors. Many netizens believe that Huawei’s use of competitors’ products on social media is obviously not a very good thing, but Samsung and Apple have made similar mistakes many times. For example, Apple recently used an Android device to post on Twitter.